This desk has been sold. This desk is in as-used patina and shows minimal wear and tear. There are no major dents, dings, or scratches anywhere. The top is smooth, the drawers operate with no drama, and the metal base has no damage. There are two small pieces of laminate trim missing from the edge, as shown above. These can be readily repaired, though West Hills Wood has chosen to leave this task to the next owner. We have more Fletcher Aviation Desk information on another page. 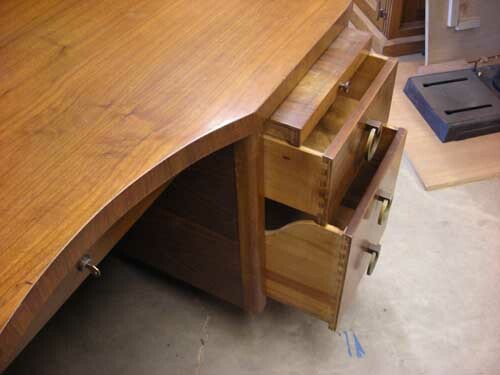 To recap, Fletcher turned to furniture design and manufacture after WWII and found some success with this desk. 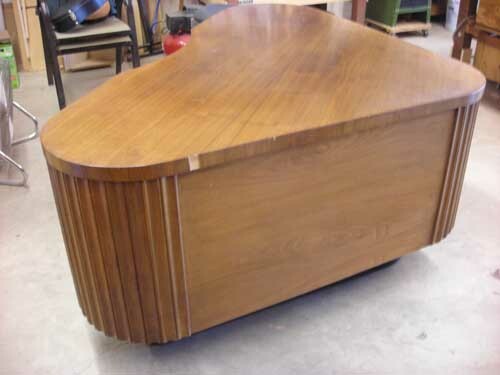 It consists of walnut plywood for the top and sides, solid walnut scalloped corners, solid drawers, and a metal base. 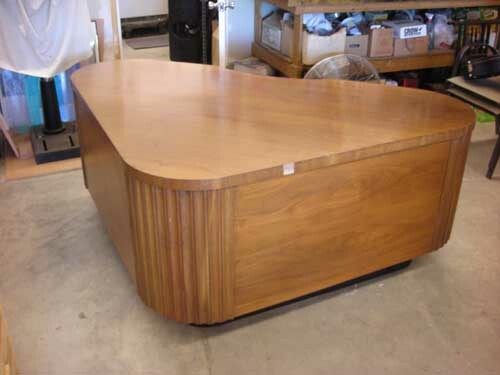 This particular desk had a single owner since 1987 and was used in a home office. Minimal wear and tear results in as original a desk as you will find anywhere. We have restored several of these and have decided to let this one alone. It could use a good cleaning, but needs nothing else. All six drawers operate smoothly and have no cracks nor missing pieces. The center drawer engages the functional locking mechanism and still has the original key. One drawer has lost it's latch,but all others still lock. The two pull out side trays are intact and in fine condition. The metal Fletcher Aviation desk badge is in place. 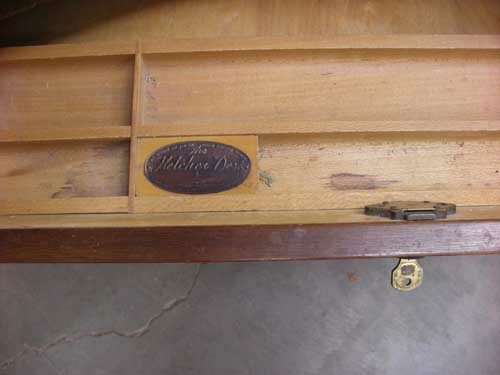 It indicates "Patent Applied For" which tells us the desk was made in early 1945. Fletcher was granted a design patent in mid-1945. 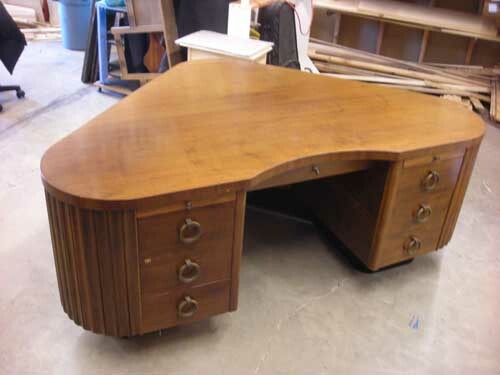 This desk has all the features of the patent design, thus our claim of early '45. These features include the metal base, solid scalloped/fluted corners, and drawer locking mechanism. 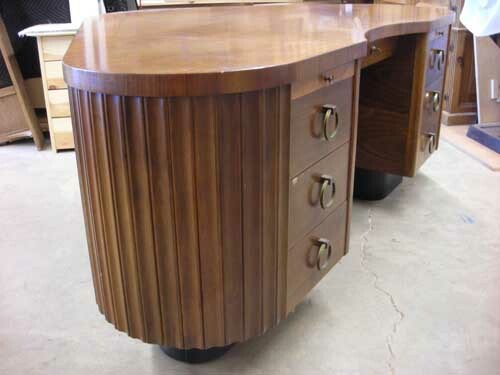 We were stunned when we first saw this desk. We've been around these for several years and have never come across one as well cared for. It was also gratifying to see that the desk was actually being used for its intended purpose. The gentleman loved working at it and was sad to see it go, yet happy to have found West Hills Wood. We'd like to pass this desk along to the next thoughtful owner. You will be hard pressed to find a more complete, working desk than this one. THIS DESK HAS BEEN SOLD. We performed some minor repairs and thoroughly cleaned this desk. It went to a very thoughtful woman who uses it in her Pasadena office.